In the wild they are found in Central America from Guatemala to Costa Rica. They are more tolerant to cooler waters about 79-84F is recommended with a PH level of 6.6 - 7.8. 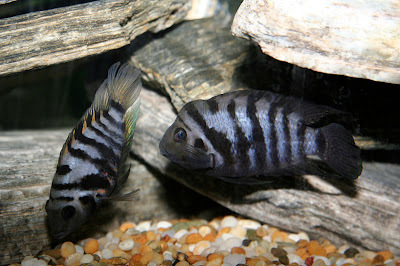 If you have more information about the Convict Cichlid that you would like to share please post it in the comments below. I have these fish. We have a few too many in the tank though, something like 4 couples, plus what 4 ot 5 baies have survived. I have found that in this situation the parents will often steal each others babies. We also tend to feed them frozen bloodworms more regularly when they have babies as they will only end up eating them otherwise... which has been the case about 90% of the time. stupid fish.